There is nothing worse than seeing an old photo of yourself. By old, we're talking five or ten years minimum. You know, the school photo, the graduation picture. Facebook, for anybody stalking your profile, can throw up these images repeatedly. An unsavoury reminder of how horrific you used to look. That youthful face may have been sweet once. Mum's also have a habit of being able to turn it up to 10 on the embarrassment scale when they want. They've got an old picture for every occasion. Graham Norton decided to play mother on The Graham Norton Show, by revealing old-school pictures of his guests. Dame Judi Dench, Jamie Foxx, Kristen Wiig and Steve Carrell were part of the star-studded line-up ready to face the shame. Graham started with the national treasure, Dame Judi Dench - a black and white photo of her 'modelling' with other ballerina girls. 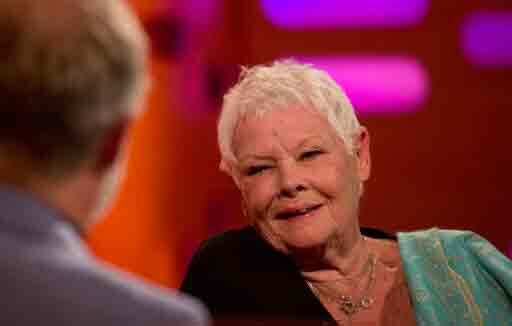 Instantly, it was clear to see which one was Dame Judi. Posing at the front, she seems not to be impressing one of her mates, Angela Beresford. The best part of this, is her revealing that Angela didn't like the middle of sandwiches. Graham replied with: 'You should have just given her a loaf'. Afterwards, attentions turned to Kristen Wiig, who claimed that she 'got perms a lot'. Agreed. Later, Graham focused on Jamie Foxx. The Hollywood actor, famed for roles in Django Unchained and White House Down, who is currently 49 years old, strangely looks older in his ancient photo from when he was 18. Perhaps, though, the best was saved until last. 54-year-old Steve Carell, star of Anchorman, Evan Almighty and Despicable Me, suddenly found a picture of a 20-year-old version of himself on screen - and he's rocking an almighty tash! "I wanted to look like Magnum PI," he joked. "I actually grew a moustache in high school because I played lacrosse and I thought it would make me look more threatening," he added. "It didn't, it just made me look like a pornstar." Sadly, we didn't get to see any of Graham Norton. The host making sure they stayed firmly away from the eyes of his millions of viewers.